Does anyone have any photos or info of Beachgrove from 1930's to 1950's. 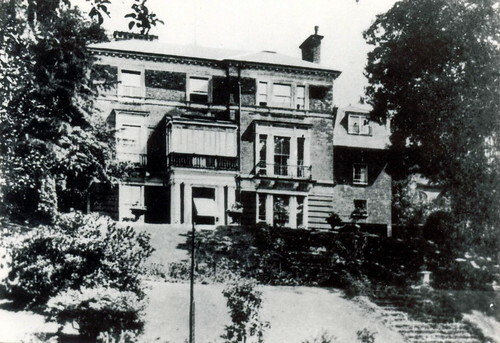 Beechgrove, 111 Sydenham Hill, was built in the early 1860s. It was a private home perhaps until the end of WW2. Lionel George Logue lived there from before 1933 until about 1940. A doctor,Michael Denny, was living there in 1946 and in 1952 it became the Beechgrove Home for the Aged Sick. The house was demolished in about 1983 after many years of dereliction. Thanks Steve - I notice that there is still a sign fixed to a tree at the front of the site of the house stating the house's address - I'm not sure why. Interesting to see the site reverting to nature so quickly and to explore the old gardens in the woodland. During my exploration of the Beach Grove site, I came across what appears to be a basement tunnel..... Upon further inspection it seemed that someone was using it as a means of sleeping in. I didnt stay around too long as I expected someone to come out of it. Just wondering if anyone may know what I talking about? Sydenham Hill Wood is usually "home" to someone. The remains of Beltwood House provide an obvious choice for people wanting a more sheltered location. Over the last few years the number of people using the wood as a home appears to have risen, with the residents often appearing to be eastern Europeans. Beltwood house and under the bridge are favourite locations, but currently there is also very obvious shack/tent near the main glade. A couple of years back I wondered if the wood could end up with it's own shantytown mirroring the whats often seen on the continent. Hasn't happened though. I went exploring with my daughter in April and came across the very same tunnel type remains. there was a sleeping bag and a piece of carpet in there then. krowman wrote: I went exploring with my daughter in April and came across the very same tunnel type remains. Ah.. I see I'm not the only one to find this little gem. When I discovered the tunnel there was a makeshift wall with a few items of clothing behing it. I couldnt tell whether the tunnel lead to anywhere as it was rather dark. I must take another visit up there to fully explore it. Lets hope i dont bump into any homeless people on the way! The tunnel appears to be part of the remains of the Beechgrove outbuilding. This was at street level and separate from the main house. If you walk along Sydenham Hill and look through the doorway into the site you can see a step to the left (its front door?) and steps down towards the main house. They don't go all the way now, there's a 20 foot drop where they used to continue to the back of the house. The tunnel leads to what was once the greenhouse. It was destroyed on the 6th December 1917 by a German air raid, when two incendiary bombs landed on Beechgrove (the other damaged the house). The house was, at the time, owned by Mr Benson. In 1939 a temporary air raid shelter was built on the site of the greenhouse and a slit trench was also constructed, leading from the house.